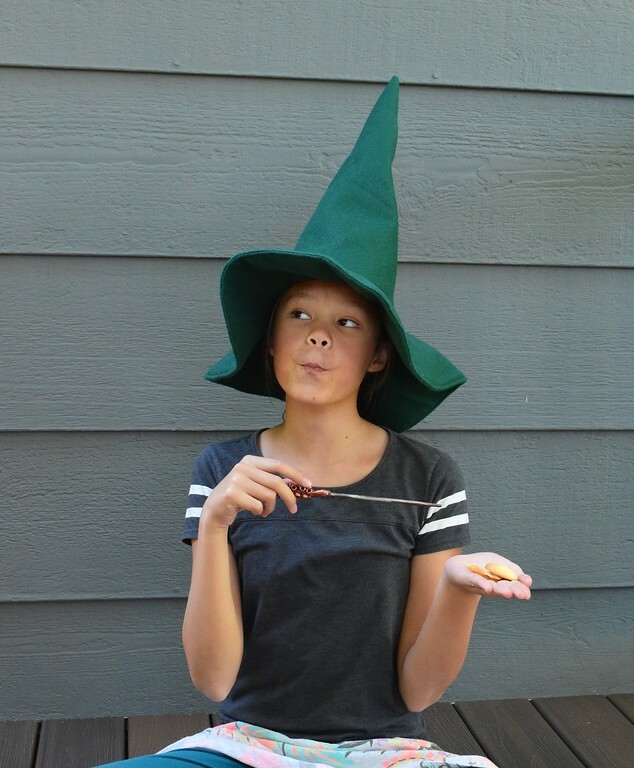 We made these witch hats for Emily's Harry Potter party as a cheaper and easier-to-make alternative to robes, which was Emily's original plan. 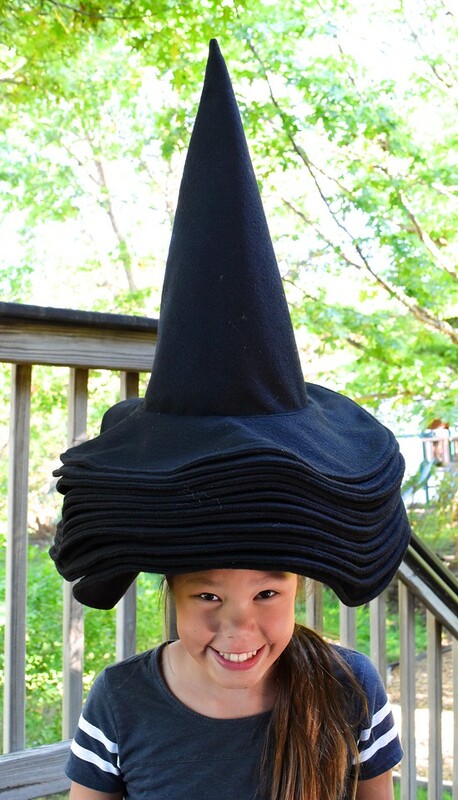 We made ours from black acrylic felt (the 72"-wide kind on the bolt) which required no interfacing. No interfacing means = no need for a lining, which makes mass-producing even speedier. 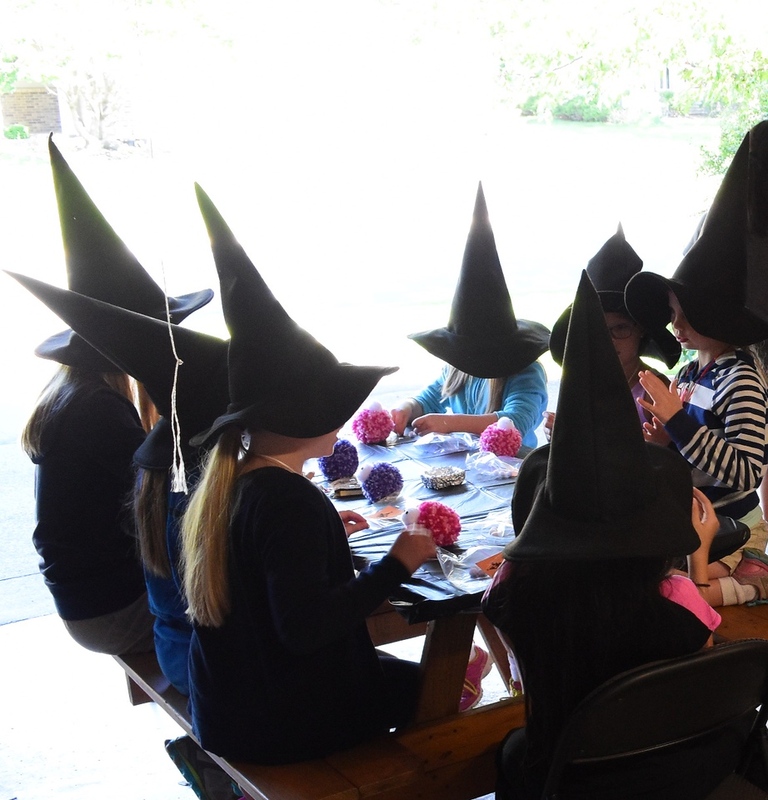 We made 12 hats from about 4 - 5 yards of felt (if I remember right), using a tight layout, but if you were making just one, I'd suggest 3/4 yard (you might be able to squeeze one hat into 1/2 yard, but if you don't care for tight layouts, you might prefer 3/4 yard). fits head circumference 22" - 23.5"
Drafting the pattern pieces is a matter of simple geometry - the crown is a cone and the brim is a doughnut - but if you'd rather not do the Math yourself, instructions to draft the templates are included in the pdf file that's available at the end of the party posts. 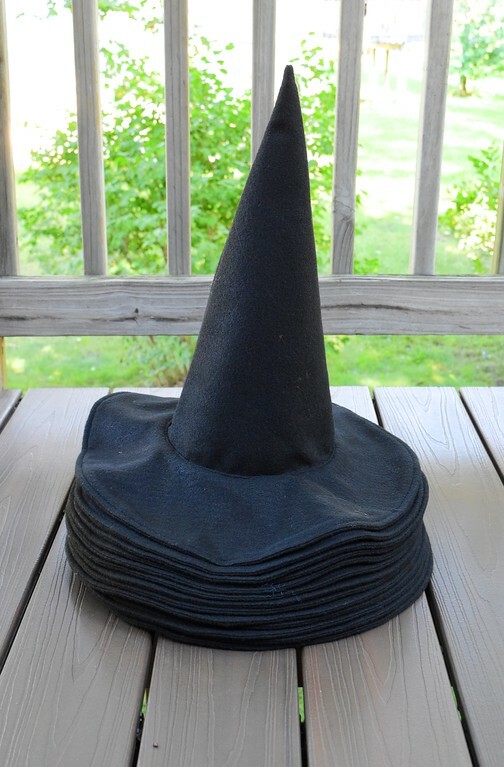 Here are some basic step-by-steps to make the hat. I photographed the green version because it was easier to see the seams of than the black. 1 pie-piece-shape for the crown, with SA along all sides. 2 doughnut shapes for the brim, with SA along the outer and inner circumferences. The construction sequence follows below. Note that felt does not have a discernible WS and RS in general, but the WS and RS are distinguished in the instructions below for cases in which you are using a fabric that does have discernible right and wrong sides. With RS together, sew the two straight sides of the pie piece shape together to make a cone. Turn RS out. Take one doughnut piece and and snip partway through the SA of the inner circle. Align this inner circle against the curved bottom edge of the cone so that the RS of this inner circle and the WS of the cone are together. Working with doughnut on top and cone underneath (shove the doughnut inside cone as you work), attach inner circle doughnut to the base of the cone. 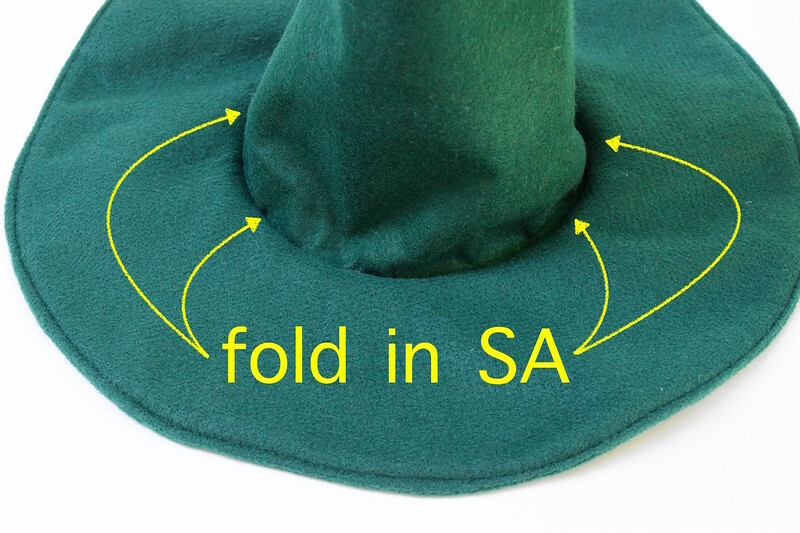 You should now have a full hat with the SA of its circular seam visible from the top. Place the second doughnut RS up on your work surface. Place the hat brim-down on the second doughnut so that the RS of the doughnuts are together. Sew the two doughnuts together along their OUTER circumferences. 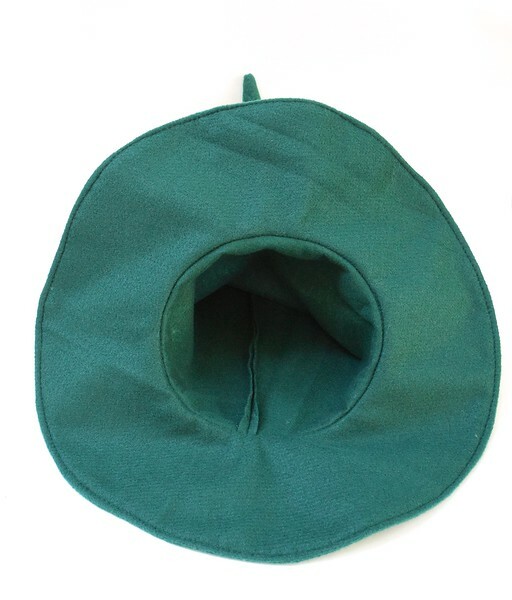 Turn this seam RS out so that the cone protrudes through BOTH doughnut layers, and topstitch 1/4" around the outer circumference of the double-layered brim (see photo below). Snip the SA of the inner circle of the second doughnut. Fold in its SA (the snips help it lie flat) to the WS and align this folded circular edge with the stitching line from Step 2. Topstitch (or edge- stitch) through all layers to attach the second doughnut around its inner circumference. You can see this line of edge-stitching in the black hats below, just around the base of the cone. 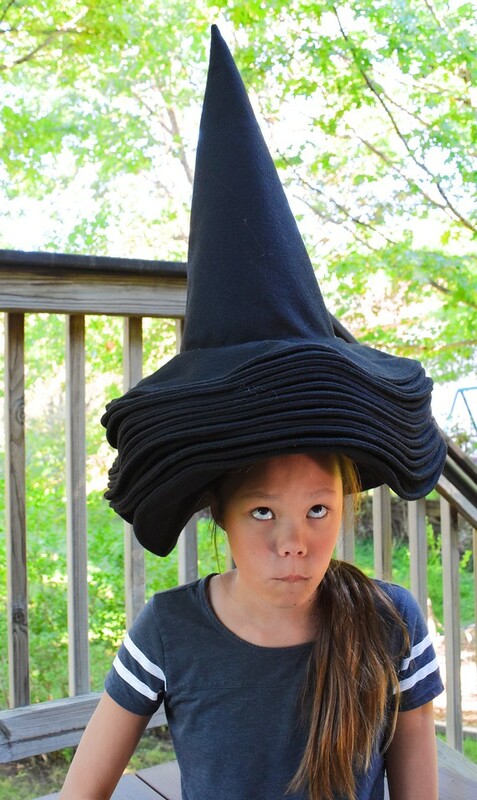 These hats stay on heads very well. LiEr, you just made my morning! We JUST got the felt to make these, and I was hoping hoping you would share a tutorial. Thank you!!! What a ham! My kind of girl! Would you mind explaining why you join the outer edge of the donuts together prior to the inner edge? Does this make it easier? Or is it just a preference? Thank you for sharing. Unknown: it really is preference, I guess. 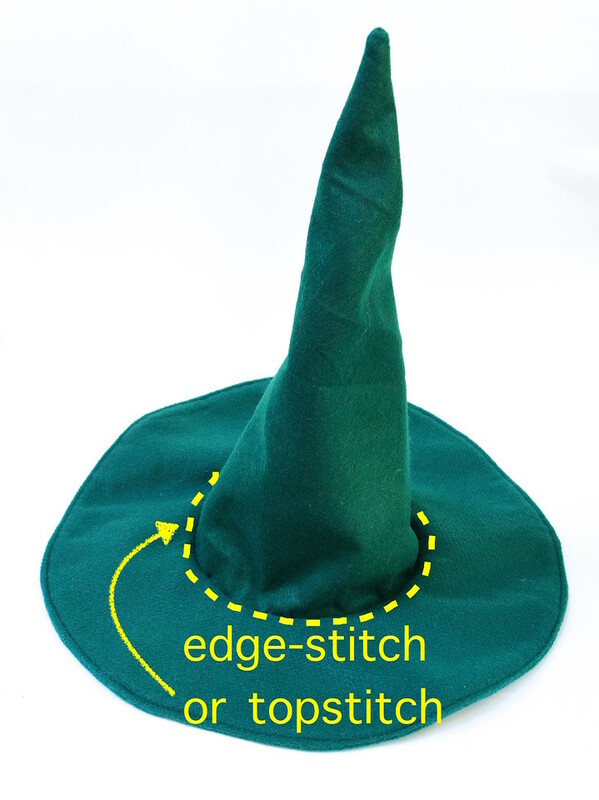 All except the final brim seam can be sewn RS-together and turned RS-out. However, that final brim seam is going to have to be folded-in-and-topstitched because we can't sew that RS-together and turned inside out. And since all the brim seams are curved, I picked the one that's shortest, and doesn't end in a free edge, where it'll be easy to see any spots where the folded-in-SA doesn't align perfectly in the two layers. This last seam lies against the bottom edge of the cone, lands right against it (so I can use the underlying stitching line as a guide) and is the smaller of the two concentric circles (i.e. shorter seam to sew than the outer circumference).